about the education qualification, age limit, selection process, application fee other details will be given below. Chitradurga stenographer jobs interested candidates should apply based on the details mentioned. Chitradurga Jobs applying candidates should complete 7th Standard and SSCL. 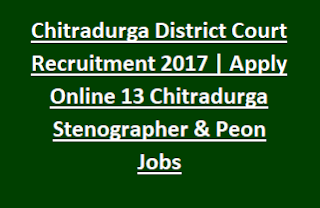 Proficiency in kannada language more details about Chitradurga District Court jobs click on chitradurga official website given below. Chitradurga District court jobs interested Candidates age limit for General Candidates 38 Years, For SC/ST Candidates 40 Years. Age relaxation will be applicable for reserved category candidates. Selection for this chitradurga district Court jobs will be done through personal interview. SC/ST candidates needs to pay Rs.50/- and other category candidates application fee is Rs.100/- pay fee online or offline using SBI bank chalan.